ICC Open - The Last Samurai! IM Cemil Can Ali Marandi, who likes people to call him JJ, won the ICC Open 2017. His ICC username is Last7Samurai, and he acted indeed like a warrior, playing precise, fast and deadly chess through the whole event. ICC's great commentator GM Eric Hansen was amazed and impressed by JJ's play, and complimented him sincerely during the interview after the finals. It's been the ICC Open of the "upsets". Among the super-strong 32 finalists, there were specialists such as Alexander Grischuk, Ding Liren, Leinier Dominguez Perez. But the so-called "underdogs" played great blitz chess, and it was clear pretty soon that the top players would not have had an easy way to the finals. Watch GM Eric Hansen's interview with the ICC Open Champion! Grischuk, after a tough first round, which saw him win after six hard-fought games against FM David Gorodetzky, had to raise the white flag against the strong French GM Julis Moussard. Ding Liren went down after an epic battle against another super-FM, Sebastian Horgen Mihajlov. Leinier Dominguez Perez lost in the round of 16 to the young GM Aleksandr Bortnyk, one of the strongest blitzers who play regularly on ICC. The two American wonder kids, Samuel Sevian and Jeffery Xiong were both eliminated by GM Federico Perez Ponsa, who then made the semifinals, where he lost to GM Safarli, another uber-strong player. And now, let's see what JJ was able to do, to clinch the ICC Open title. Ali Marandi started destroying one of the blitz gurus that dominate the ICC scene: GM Eduardo Iturrizaga. Then he had to play his teammate the young Italian GM Francesco Rambaldi. In the round of 8, JJ had to fight his way to the semifinals with Moussard, who had previously eliminated the favorite Alexander Grischuk. Without apparent effort, JJ reached the semis, where he found on his path Vladislav Artemiev, another of the specialists attending the tournament. It was a tough match, and JJ prevailed after the first two-game playoff. 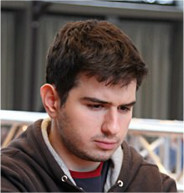 On the other side of the grid, the Azeri GM Eltaj Safarli sailed through apparently calm waters, reaching the finals without having to go to playoffs once. His dynamic and powerful play allowed him to beat Perez Ponsa in the semis losing only one game. The final match was something else. The two players were on webcam during ICC's broadcast of the event, and their concentration, joy, disappointment, tension, relief, was visible on their faces. The first five games, with time control 3 0 ended in a tie. At that point, GM Hansen said that now Safarli was favorite, with five games at 3 2 to play. But JJ was not going to agree with our Eric and went on playing amazingly fast, though not precisely as he previously did, probably due to the tension and the tiredness. It was a fantstic event, with hundreds of people watching and rooting for their favorite players. Watch the live commentary with GM Eric Hansen!